With longer class periods, the students will now be able to dive deeper into the curriculum. The pace of the day changes so that they spend less of their time moving around, going from point A to point B, and more of their time doing what they are doing, whether that is in the classroom, in advisory, or at recess. When they're there, they are really there, deeply exploring and engaging. Middle Schoolers are ready. They are ready for independence, challenging academic courses, exciting athletic competitions, creative art experiences, and new relationships with classmates and teachers. For us to best support our Middle School students, we must provide them with a place where they can be independent, where they have flexibility in how they structure their homework time, where they can be part of clubs and afterschool activities, and where they can express their opinions and participate in classes that are designed around student collaboration. They need a place to test their independence, where they always know that there is an army of teachers standing behind them, encouraging them when they struggle and celebrating each of them along their journey. The new schedule for the Middle School was developed using five guiding principles: quality learning time, healthy pace for students, collaboration time, community time, and access to program. It was designed with the interest of our students at the center, and includes exciting features such as longer class periods and fewer classes in a day, longer time for lunch and recess, and more time for collaboration with classmates and teachers. Imagine how this will transform a school day for a middle schooler: deeper, more meaningful learning combined with more time (and less rushing from place to place!) to discover those untapped talents and interests that have simply had to wait. If you ask a Middle Schooler about being a Middle Schooler, you will likely hear first about their homework and second about how busy they are. For Middle Schoolers, there never seems to be enough time. They are always rushing, in some order, from class to class to lunch to recess to class to class. The new schedule will follow a six-day cycle during which classes will rotate, meeting four out of six days, and will be 60 minutes. Longer classes means more time learning and collaborating with classmates and their teachers through labs, discussions, or in-class projects; this added time will allow students to process and consider the material in the moment, instead of needing to rush off to another class. With fewer classes meeting each day, the number of times a student must move from one class or activity to the next decreases, and there is designated time in the new schedule for students to move from one place to another, allowing them to slow their pace and not rush throughout the day. And because classes do not meet every day, homework will not be assigned by every class each day. Our Middle Schoolers have an abundance of activities and programs available, but it has been difficult for them to carve out the time to participate. The new schedule allows for increased time and opportunities for things such as club meetings, student government, and the literary magazine. 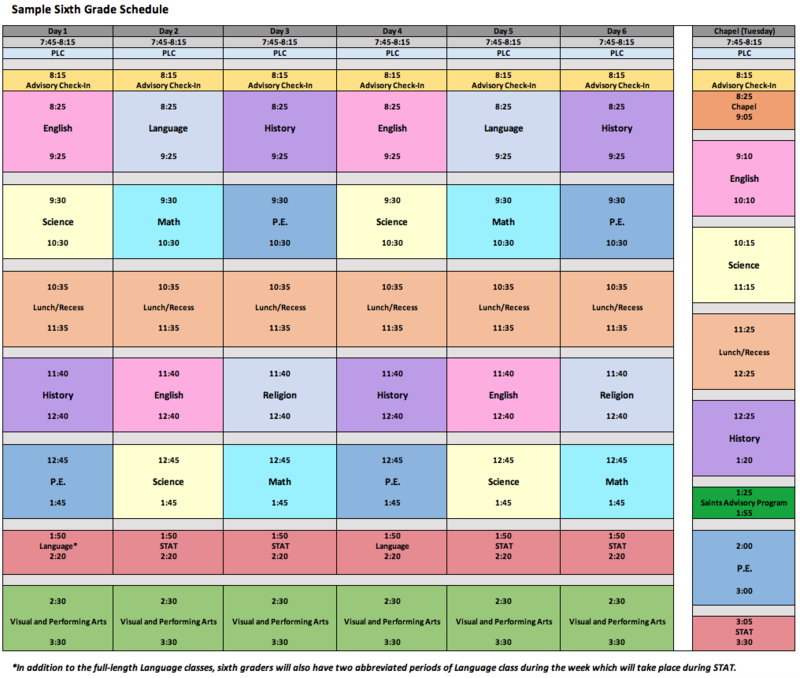 The design of the new schedule also means there will be increased class time for 6th and 7th grades in Modern and Classical Languages, and for 8th grade in history. We are excited about the increased potential for the Academic Center to integrate more into the classroom where our resource teachers will have the opportunity to witness how students learn and study and work with their peers. The new schedule has designated time each week for the Saints Advisory Program, an important and valued part of our Middle School experience that helps our students truly live our mission to pursue goodness as well as knowledge. Students will have the opportunity to work with one another and their advisor on important topics, learning from each other and sharing diverse perspectives. The new schedule will enhance collaboration time among teachers as well, benefitting both them and their students. Each morning before the start of the school day, teachers and administrators will participate in Professional Learning Community (PLC). The PLCs will enable teams of teachers and administrators to connect in a regular and dedicated way to plan together, reflect on and revise curriculum, evaluate assessment data, and collaborate to support students. The PLC period will also enable teachers to participate in committee work focusing on whole school initiatives, planning, and curriculum development. This time together for the teachers will increase the impact they will be able to have on individual students and their needs. What is a rotating schedule? 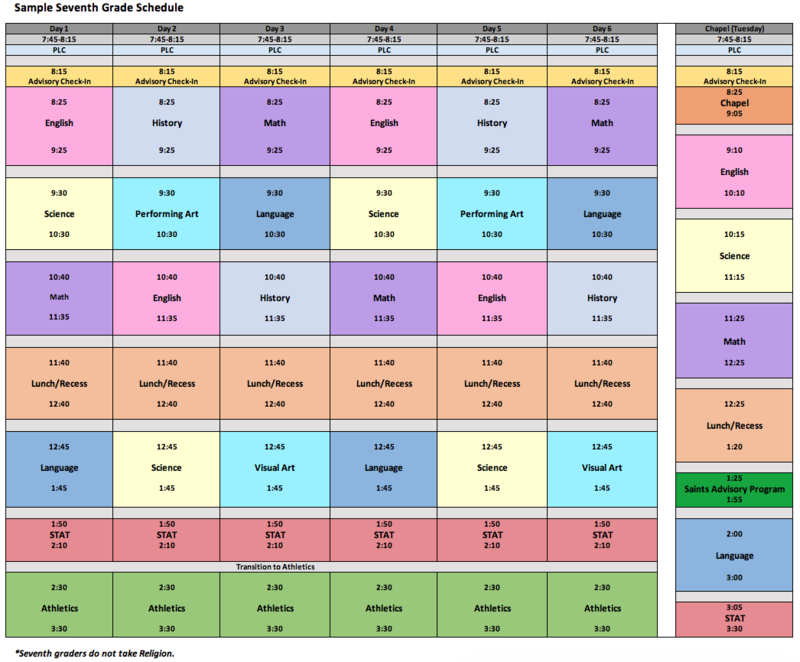 The new schedule will follow a six-day cycle during which classes will rotate, meeting four out of six days, and will be 60 minutes. The rotation of the schedule means that classes will not always meet at the same time every day. Do seventh and eighth graders eat lunch at the same time? We are exploring different ideas for lunch and recess for seventh and eighth graders and are excited about re-envisioning the setup. Our aim is to provide more choice and options for social, play, and learning opportunities for the seventh and eighth graders during lunch. We hope to provide greater student choice and variety, including clubs that consist of both seventh and eighth graders and meet during the lunch/recess period. How will my child know what day in the six-day rotation it is? The full-year schedule will be published on the website, in the school calendar, in the student planners, and in the daily morning report. May I drop my child off before 8:15? Yes. There will be free supervised morning care beginning at 7:30 a.m.
Will lunch and recess be affected by the new schedule? Yes, students will have more time for lunch and recess -- roughly an hour each day. This will allow for a healthy pace for eating and relaxing, as well as more flexibility for clubs and activities. When do students have advisory? Students will check in with their advisors before first period every day, and they will have STAT most afternoons. Every Tuesday, students will have Saints Advisory Program time in the afternoon. Because their sports do not meet on Tuesdays, classes are not shortened and STAT will still meet. Are longer class periods appropriate for Middle School students? I’m worried my child can’t stay focused for 60 minutes. Student engagement increases with longer class periods because there is increased potential for flexibility and variability in lesson planning. Students are able to truly get “in the zone” of learning, and classes become even more student-centered. There is more time for one-on-one work with students and teachers, as well as increased potential for student collaboration. My child has an extended time accommodation, how will that work in the new schedule? Much of the extended time for assessments will happen during the class period itself, a terrific benefit of longer class periods. If extra time during the class period itself is not sufficient, the hour at lunch and recess will be beneficial for extra time, as will regular STAT periods. How will the new schedule affect homework? Students will have fewer classes to prepare for each night and will not receive a "double load" of homework on days when classes don't meet. This will give students more autonomy and flexibility to complete homework assignments and study. When will students have Student Teacher Appointment Time (STAT)? Students have STAT every day in the afternoon before sports or Visual and Performing Arts or at the end of the day on chapel days. Having this time before sports will be helpful if students have away games with early dismissals. Will course offerings in Middle School change? All eighth grade students will take a full year of History 8. Students will take religion in sixth and eighth, increasing the time in those two grades and eliminating the one-day/week course in seventh grade. There will be more time for the Modern and Classical Languages for sixth and seventh grades. In eighth grade, students will choose between Visual Art and Performing Art. Students who would like to take both courses in eighth grade may opt to take religion over the summer, opening time in their schedules for both Visual and Performing Arts. Why do sports meet four out of five days? The Athletics Department has wanted more time for focused practices. Students will now have 20 minutes to transition to athletics, including traveling to/from facilities, changing into athletic clothes, and moving equipment, and will have more time (60 minutes) to actually work with their coach and team. These longer practice periods are conducive to better skill and team development. What will Chapel look like in the new schedule? Chapel takes place on Tuesday mornings, the day when Middle School students don’t have athletics. This is especially advantageous as students won’t have to change into athletic gear on chapel days. The chapel service will remain the same. PLC stands for a Professional Learning Community. These meetings provide a regular and predictable opportunity for teachers to work collaboratively to develop and refine curriculum. Vibrant and robust PLC programs have been shown to improve the learning experiences of students and have been shown to elevate student achievement in several studies. What happens in the event of a snow day? The daily rotation continues, skipping that particular day in the cycle. For example, if school is closed on Day 2 and 3, when the students return to school they would follow the schedule for Day 4 of the cycle. What was the process for developing the new schedule? The schedule revision work was an intensive 24-month process that began in 2016. The work was lead by a collaborative team comprised of faculty and administrators and assisted through the counsel of an external schedule consultant. In advance of the design work, the faculty developed two important framing documents (i.e., Hallmarks of Teaching Excellence and Values of Time) that were aligned with the mission of the school. These documents helped us set revision priorities and guided our thinking during the process. Our faculty and students completed climate and culture surveys, developed by Independent School Management, to help us better understand the needs of students in our community. Our faculty also ‘shadowed’ students to experience the daily schedule from a students perspective. From this work, a set of five guiding principles emerged that would drive the schedule revision process: Access to Program, Community Time, Maximize Quality Learning Time, Collaboration Time, and Healthy Pace for Students.